I’m in “Where Women Cook”! I don’t even know how to describe how weird it feels to say this. I’m featured in a magazine. A beautiful, inspiring magazine! I first heard of “Where Women Cook” way back in December of 2010, when a food/photography blogger I have followed, Ree Drummond, was featured on the cover of the inaugural issue. The quarterly magazine is chock full of stories of women who are doing interesting things with their lives. All different kinds of women, doing all different kinds of things. Things like homeschooling four children on a cattle ranch while writing cookbooks and publishing highly successful blogs. Running small local bakeries, restaurants and businesses. Working as chefs in world-renowned NYC restaurants. Their stories are told from the heart of their homes — their kitchens — and they share how their passion for food fits into their stories. 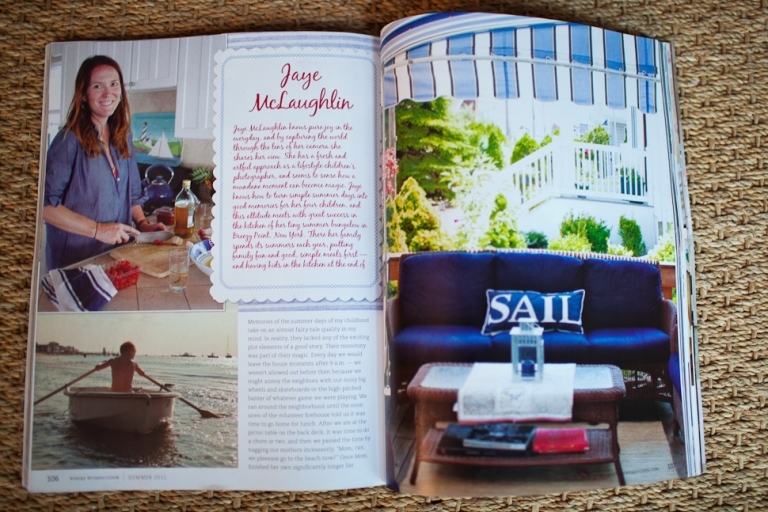 Peppered throughout the features on the gorgeous magazine spreads are photos of their homes and tons of favorite recipes. What’s not to love? Never in a million, trillion years would I have imagined that I’d see my own face looking out from this magazine’s pages, but LOOK! My story is centered around my “beach kitchen” in Breezy Point and how my appreciation of the summers I’ve spent there have helped me realize my passion for “freezing” moments and helped to inspire my photography business. The pages are beautiful and have me looking forward to summer 2012 even more than I was just a few days ago. You can read more about Where Women Cook here: http://wherewomencook.com/about/. I bought my first few issues at Barnes and Noble, but now am a subscriber. If you’d like to have a look at my super-special complimentary advance “You have been published!” copy, my arm might just be twisted. Stop by! … and thanks for reading!